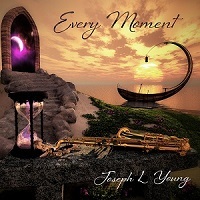 There's a quiet beauty in the music of Joseph L Young's fifth album Every Moment. I was quite familiar with his flute work in the past, but this time he brings to the table the saxophone and serves it up in a New Age setting. Pretty unusual to begin with, but he makes the instrument palatable to the occasion. Every Moment is twelve tracks of New Age and contemporary instrumentals with a bit of subliminal jazz thrown in for good measure. One of the tracks is a spoken word piece and I'll get to that later. Young's music is organic, harmonically-rich, and lyrical. The album highlights the concept of time in all its expressions; hours, times of day, seasons, years, and beyond. The voice of Young's saxophone is sinuous and subtle. It interacts with the modest instrumentation like a friend. Joining Joseph are Cornell Kinderknecht on bansuri flute and viola by Lisa Bittick. Their performances are complementary and unobtrusive. The first cut is called Prism. Synth waves wash over the melody, but the sax comes in and guides the tune with a gentle voice. The prism, in this case, diffracts the music into sonic waves that please the spirit. Instead of colors we experience tones. The tin whistle in this cut gives it a slightly Celtic diffusion which is quite agreeable. A soft voice and blissful piano befriends the track Every Moment. The title tune has a soft, melodic air that is a thank you made up of musical notes. Young's composition suggest that the expressive act of offering gratitude is an ongoing process. The music flows, oh so gently and envelops the soul. It is a tender submission that is quite memorable. Time Traveler revs things up and pushes the album forward. There's no spinning lights, no strange machinery carrying you along. It is the magic of sound transporting you to another time. Once you arrive, everything is new and mysterious, but the journey is worthwhile. Be prepared to be amazed as you are whisked along on something beyond your mind's perception. There are some great layers in this tune that combine orchestral and smooth jazz elements into a fascinating story. Joseph picks up his well-known Native American Flute for the tune Vicariously Blue. Yeah, you've got to love that title. How can someone else's mood dictate your feelings? Let the music explain. Emotion is like waves. Sound is like waves. We are constantly washed in these waves whether we are aware or not. Young's composition reveals these waves in the form of primal sounds touching the heart in many ways. Letting Go, a tune with Native American elements is a show stealer on this recording. The emotive voice of Rona Yellow Robe tells a story of how the planet is in pain and decides to leave us, not the other way around. Young's music is poignant as his instrument sings along with the narrator. In the background we can hear the earth breathing, the ebb and flow of breath is the percussion, the voice of the saxophone is the blood circulating through the planet. We are praying for a sense of balance. Ocean waves wash ashore as night falls. The stars appear like sparkling gifts in the heavens and we are at peace. There is a boat at the dock. We can hear the strain of ropes, the gentle bump of the hull and the solitude that this night affords. Such is the ambience suggested by the final tune Evening Repose. Joseph L Young has been teaching flute and garnering awards for some time. He currently lives in Idaho, but his musical roots are like those of the aspen. They are a living, breathing entity that go under the surface for untold miles, adding to the landscape above. In this case, it is the musical landscape. Every Moment is his fifth album and I highly recommend it. Furthermore, I look forward to hearing what the talented composer and musician comes up with next.